New subscribers this week include: Fran Cackowski, Michael McKeever, Michael Meagher, and Liz Vorum. We now have 1,938 subscribers. Happy Valentine's Day, everyone! Here's hoping you didn't mess it up. You know, I bought a very nice card for my wife a couple weeks ago, but now I'll be damned if I can find it (so I ran out and got a new one). I guess there's a plus side to shopping at the last minute, like my sons and father-in-law, who had me take them to the card shop yesterday on the way home from a movie. This week we open with an update from Kolbe & Fanning, a new book and one review. Next up are four items related to the digitization of numismatic literature and our regular section of notes from readers. Other topics include Littleton's Collector Stories Video contest, how Matthew Stickney acquired U.S. proof coins and his 1815 Half Eagle, B. Max Mehl's buildings and early U.S. collector Benjamin Watkins. 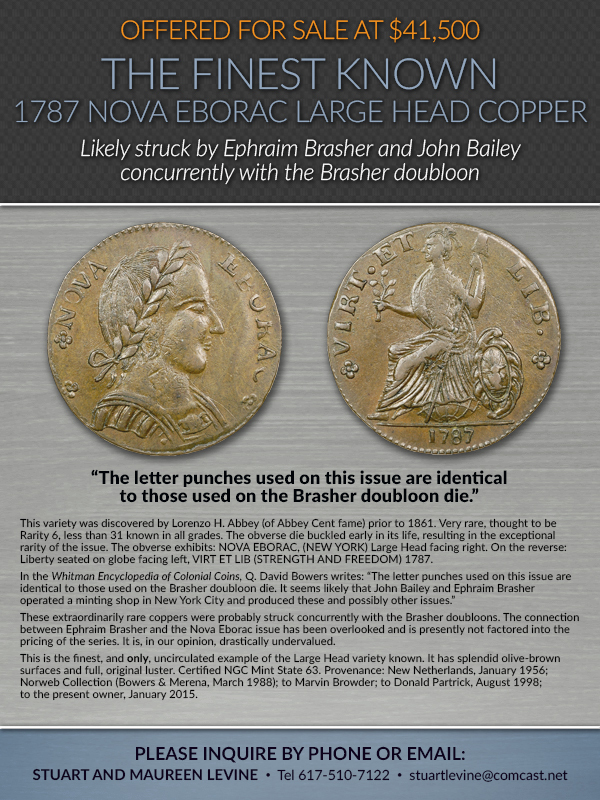 To learn more about an unusual "Half Dime" token, Mehl's grave marker, the Bechtler Mint, the globetrotting 1794 dollar, numismatics of the Olympic Games, the Peruvian Two Peso gold pattern, the T. Parker token of Norwich, England, charge coins, Tom Thumb, the Ho Chi Minh City Club, the 2016 World Money Fair, and the Sextus Pompey aureus, read on. Have a great week, everyone! 2016 began with a much-needed expansion of our offices in Ohio into the adjacent office space. When our neighbor vacated we made plans to cut a door running through to the other space; when the contractor broke through the wall, we found that fate had already placed a door there! The new space allows David and Maria to have their own offices (instead of a corner of our stockroom), a kitchenette (to keep soup off our laptops), a whole room dedicated to book photography (instead of the hot and cramped corner giving Maria back pain), and several rooms to spread out stock to examine, catalogue and ultimately offer for sale. We will be keeping our old address for mailing and shipping purposes to keep things simple. If you're ever in the central Ohio area, feel free to stop by and fill up a box or two! 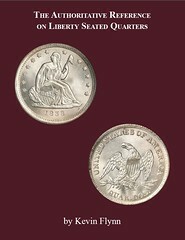 The Authoritative Reference on Liberty Seated Quarters by Kevin Flynn is at the printers and will be available shortly. This book is being self-published, with only a limited number being printed. The book is 8 ½ by 11, 320 pages. Softcover $49.95 plus shipping. The primary purpose of this book was to create a complete and comprehensive reference for the Liberty Seated Quarters series including all die varieties, history, hub changes, archive letters, historical documents, and hot topics. 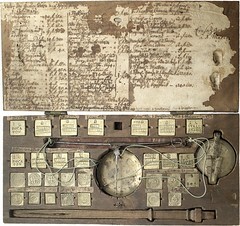 There are twelve different doubled dies, one overdate, one multi-denominational clashed die, and twenty-five different misplaced dates presented; each with a full page, full of macro photographs of all parts of the variety, complete description of the die variety, all die diagnostics, pricing, and comments. 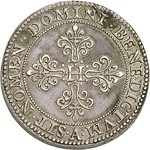 Also included are five different repunched mint marks and forty-one repunched dates. 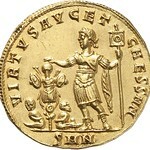 Several of these die varieties have not been published before in any book or article. The most critical aspect of any book containing die varieties are the photographs. Many of the die variety photos in this book are the clearest and most detailed presented anywhere. The author has probably taken over 30,000 micro-photographs over the past 25 years and is considered one of the best for close-up coin photography. 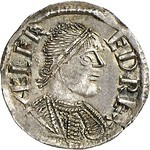 For some of these die varieties, an analysis is presented as to what caused them and if they are questionable or refuted. For example, the evidence is overwhelming that what was believed to be a 1845 Large/Small date is simply just a repunched date of the 1845 quarter date punch. A section is included on how die varieties are made, which presents a detailed study on the evolution of the die making process and on each type of die variety. This section and the analysis presented on the varieties for example, will help teach you the different classes of doubled dies and how they were created, why when the date is punched lightly into the working die it leaves a skinnier impression. The more you learn, the more you will enjoy studying your coins. A complete analysis is presented on the design changes made in the Liberty Seated quarters, and for some showing detailed photos of the differences. Some of the designs that were changed were previously unpublished. Some of the differences in design occurred over a period of 20 years, while others were not design changes, but a change in the relief of the design elements. All of the eagle’s claw designs between 1838 and 1840 are presented to be able see the distinct differences. An analysis was also done on date and mint mark changes that occurred within a single year. 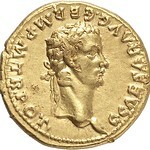 An authentication section is included presenting diagnostics and detailed photos to help validate genuine specimens of rare coins. The National Archive letters and the history section in the beginning of the book include those letters and historical information as presented in the book, The Authoritative Reference on Liberty Seated Half Dimes. Several new letters were uncovered at the archives and included. 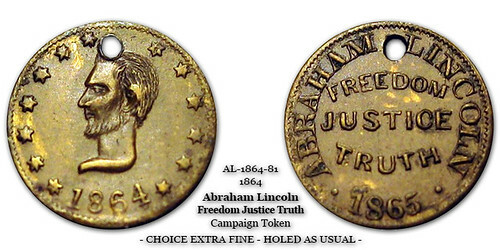 Some of these were important, for example, several helped in the understanding of proof coins struck at the San Francisco Mint in 1854 and 1855. The history chapter in the front was updated with new information learned while researching the Liberty Seated quarters and this section was also extended through the beginning of the Barber series. As these series were produced in parallel, it was decided to include all of the information for all of the Liberty Seated series for this time period to show what decisions and actions occurred concurrently. In addition, it is important that each book on each series is complete and all inclusive, and not require a different book for reference. These archive records are critical to any serious collectors of the Liberty Seated series as it presents the history and background in the creation of these designs from those individuals responsible for creating them. 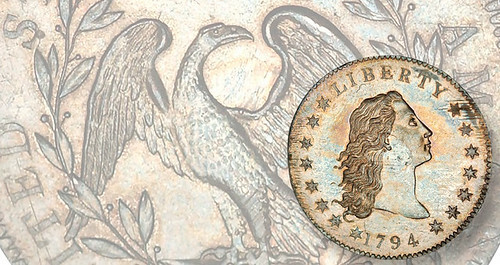 These archive records, detailed study of the die varieties, and complete analysis of the hot topics presented in these Authoritative Reference on the Liberty Seated series help collectors evolve to the next level of research and enjoyment of these series, such as already seen by collectors in older U.S. coins such as the Bust series; see for example the discussions in the Bust Half Nut Club or the John Reich Collectors Society. This book also presents information important to subjects such as the number of proof coins struck for a given year, or that the New Orleans Mint carried forward reverses for some years. Some of the previously listed proof counts by Breen and others were incorrect. 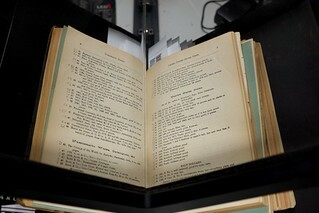 The correct counts were used for example to update totals listed in books such as the Red Book. The Hot Topics section contains a several detailed studies on the Liberty Seated quarter series including an analysis of: the refuted 1845 Large/Small date; 1854-O Huge O; 1856-S Large/Medium S; 1840-O Transitional Reverse; 1842 Small and Large Dates; 1849-O quarter; 1855-S proof quarter, questionable 1858 off-denomination clashed quarter’ 1865 Motto quarters; 1866 No Motto quarters; 1870-CC through 1873-CC quarters, 1870-S quarter; early Liberty Seated proofs; early U.S. proof coin distribution, analysis of Liberty Seated certified proofs; and Liberty Seated proof counts. Did you know that there are only two 1855-S proof half dollars, both of which were delivered to the Director of the Mint? Price for the softcover is $49.95. To order, send a check or money order to Kevin Flynn, P.O. Box 396 , Lumberton , NJ 08048 . Please include $5 for media shipping or $10 for first class shipping. Please email me at kevinjflynn88@yahoo.com to reserve a copy. See other books available at www.kevinjflynn.com. 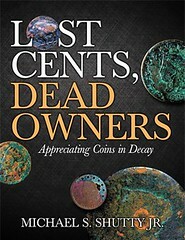 by Michael S. Shutty, Jr.
It’s not often that a piece of numismatic literature actually deserves to be called “literature,” but this slender volume does. Coins are “things,” and all coin books describe these things; Shutty’s book does this, too, but it is more a book about passion for these things. If history held in your hands is good, history and mystery in your hands together have to be that much better! The book contains a preface, eight chapters and an epilog. The seventy-odd pages are divided roughly in three parts: a description of corroded coins with emphasis on the intense colors of their encrustations, a description of the chemical processes that corrode copper and nickel, and advice on collecting corroded coins. Each is interesting and worthwhile. Make no mistake: this is a love story. If you doubt it, the preface is titled “Loving the Unloved,” and the first chapter is titled “Sweet Corrosion.” He makes the very important point that dug coins, a.k.a, grounders, can be souvenirs of important events or even previous civilizations. They are very important in establishing archaeological context. 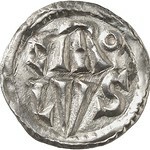 Unlike uncirculated coins, they were used in real commerce by real people. 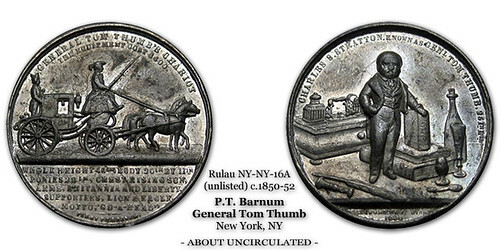 We collectors prize Mint State coins, but they are not really relics of history in your hands. Sure, that lovely choice Mint State 1794 large cent was made when Washington was President, but since it was always stored, it has no real history. You can be assured that neither he nor anyone else ever spent it. But it isn’t just about the history. Profusely illustrated throughout with large color photographs, this book will make you admit, if grudgingly, the beauty of corroded coins. How often have you seen the words “a great read” in a review of a numismatic book? If you haven’t figured it out by now, let me say that this book is a great read, rivaling Bowers and Sheldon at their most entertaining. If Shutty has not actually made me “love” corroded coins as he does, he has certainly made me appreciate them much more and gave me great pleasure along the way. I heartily recommend this well-written and entertaining book, which somehow finds the intersection between numismatics, history, geochemistry and love, to anyone with even a passing interest in any of those things. The format is large at 8.5 x 11. 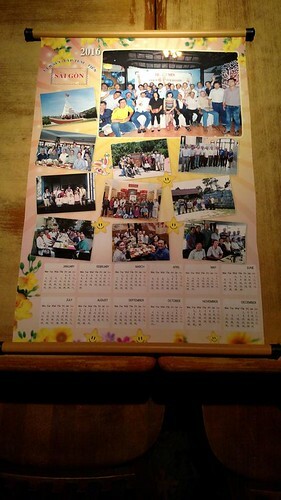 All the photographs are in vivid color. The book is available for $24.95 from Books123.org. Also, please check out the book information on my Google blog: oldcoinnecromancer.blogspot.com. Thomas Lindsay Elder (1874-1948), one of the most prolific numismatic catalogers of all time, left a legacy of 292 auction sales in addition to a mélange of other written works. Dan Hamelberg has generously loaned his plated Elder sales to the Newman Portal for scanning, and these are now available in the Newman Collection on Internet Archive. Among the more important sales are Gschwend for colonials, Gilbert for large cents (1910), and Gehring for federal and pioneer gold (1921). Hamelberg also loaned manuscript material, including correspondence related to the sale of the Lawrence collection (1929), which contained important territorial gold. These papers offer an inside look at the auction business in the 1920s, revealing that Elder’s “rack rate” for commissions was 25%. Another manuscript item is a veritable treasure map of Elder’s house, apparently written shortly before Elder’s death or during a serious illness, which details locations of various desiderata. “Look out for an envelope [of] 1877…Indian Head cents,” Elder advised, suggesting that Elder’s office, like many today, was not the most organized. Finally, this group includes ephemeral publications of Elder such as Elder’s “Illustrated Bargain Retail List for 1929,” featuring a wide array of ancient, foreign, and American coinage. 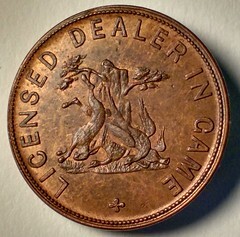 The U.S. coins are offered on a “type” basis, such as California gold quarter dollars at $1.75 each, “not to be confused with the numerous counterfeits being advertised by ‘coin dealers,’ bearing old dates, but a modern manufacture and made by the thousands to sell to suckers.” The source material here is easily enough to fuel several articles, and is now available to all. It’s the end of the day, you’ve worked hard, and now you’re home and it’s time to relax. So you open up your laptop and settle in to transcribe some bee specimen labels. Or the packing list of a space shuttle. Or the field notes of a naturalist tromping through early 19th century Ireland. It may sound odd, but plenty of people would rather parse the curly, old-fashioned handwriting of a bugle player in a Civil War military band than stream an old episode of Breaking Bad, as part of the Smithsonian Institution’s online Transcription Center. So far, 5,883 volunteers from around the world have transcribed more than 150,000 pages from over 1,000 projects. This effort exists because of a simple fact: just digitizing something isn’t the last step in making something useful to scholars or the general population. 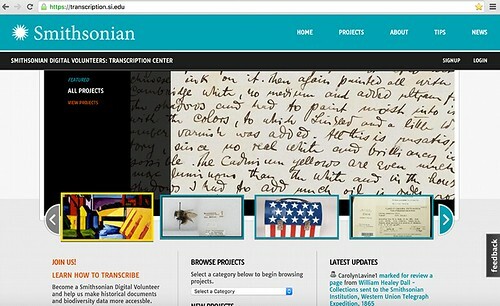 “Digitizing materials is really important but that’s not the only step to making them accessible,” says anthropologist Meghan Ferriter, project coordinator of the Transcription Center. 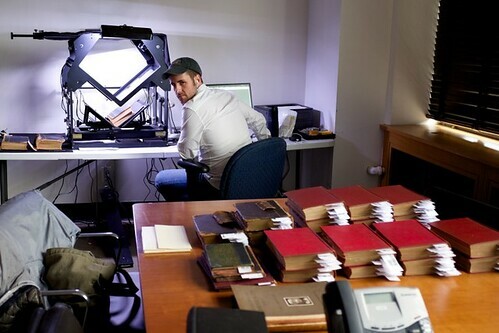 Launched in 2013, the project invites anyone with access to a computer to choose from a buffet of documents supplied by 14 of the Smithsonian’s libraries, archives and museums. Volunteers participate anonymously or create profiles, and each project comes with specific instructions. Participants read scanned pages and type their transcriptions into a field below. Many users work on multiple projects in small chunks, so that any given text is transcribed by a team. Transcriptions are reviewed by fellow volunteers and then signed off on by a Smithsonian staffer before being declared complete. Len Augsburger, Project Coordinator for the Newman Numismatic Portal, will be joined by Wayne Homren, a Past President of the Numismatic Bibliomania Society and Editor of the E-Sylum electronic newsletter, in giving a program at the 77th Anniversary Convention of the Central States Numismatic Society entitled: The Newman Numismatic Portal: What It Is, How It Works and What It Can do For You. Administered through Washington University in St. Louis, the Newman Numismatic Portal digitizes numismatic literature and makes it available on a free forever basis to numismatic dealers, collectors and researchers. 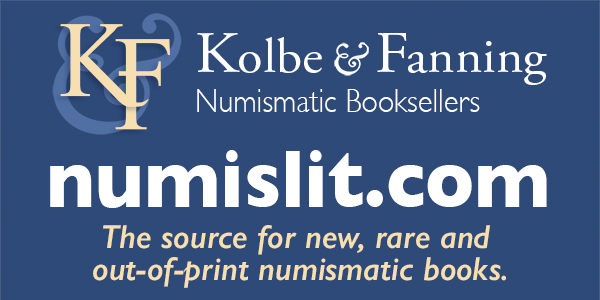 A number of numismatic specialty publications are already represented on the Newman Portal, including the membership journals of the Central States Numismatic Society, the Numismatists of Wisconsin and the Missouri Numismatic Society, as well as others. The program will explore the current status of the Newman Portal, give demonstrations and discuss its future initiatives. In addition to his role as Project Coordinator for the Newman Portal, Mr. Augsburger is a co-author with Joel Orosz of The Secret History of the U.S. Mint, winner of the Numismatic Literary Guild Book of the Year Award in 2011. 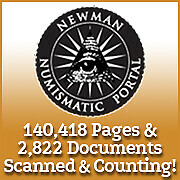 In 2015, he was also the co-author with Orosz and Roger Burdette of Truth Seeker: The Life of Eric P. Newman. 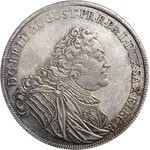 Augsburger currently serves on the boards of the Liberty Seated Collectors Club and the Numismatic Bibliomania Society. In addition, he is a Fellow of the American Numismatic Society. 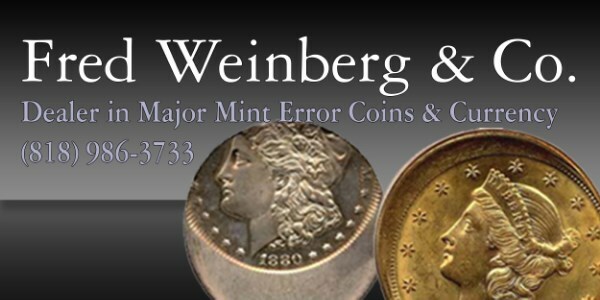 His co-presenter, Wayne Homren, serves as a consultant to the Newman Numismatic Portal and is also a Past President of the Western Pennsylvania Numismatic Society and the Pennsylvania Association of Numismatists. In 2008 he received the Burnett Anderson Award, presented in recognition of excellence in numismatic writing by the American Numismatic Association, the American Numismatic Society and the Numismatic Literary Guild. The program will be given at 1:30PM on Thursday, April 28 in Nirvana Room C of the Schaumburg Convention Center, 1551 North Thoreau Drive, Schaumburg, Illinois 60173, site if the CSNS convention. Additional information about the Central States Numismatic Society convention, including the complete Schedule of Events, detailing bourse and auction hours, as well as the full roster of educational programs to be held there, is available at www.centralstates.info. A comment on Bill Murray - what a great guy! Whenever I would see him at a coin show, we would sit down and share stories. He would freely pass along information on any number of topics. And he was well known for his love of the kids, supplying them with various freebies and running programs for them too I believe. Personally he helped me with some advice on my several books, especially the two volumes on military tokens. He will be missed. I was shocked to hear of the passing of David Ginsburg. 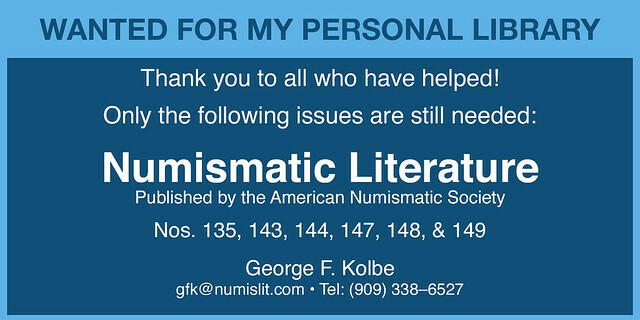 We had occasionally corresponded since 2005, most recently on January 23rd about an article he was writing for The Numismatist. David was fascinated by the economics of precious metals and their impact on coinage, and always found the little-known sources of information – obscure government reports, banking histories, and the like. He wrote in The Asylum, The Numismatist, the Gobrecht Journal, the Southern Gold Society Newsletter and no doubt other publications. In 2005 I forwarded to him information from the National Archives on the Kerens, TX gold hoard (1947), which he carried forward with additional research. I am sure he would have continued to share his insightful and careful work, and the numismatic world is a lesser place without him. 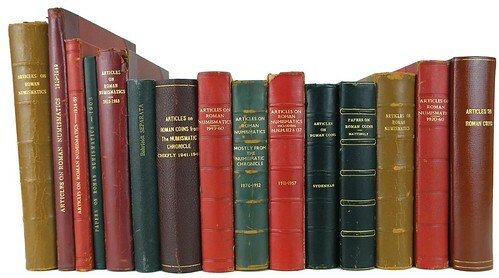 The prospective purchaser searching through the sale of the John Huffman library should be alert to this oddity: that a number of items described as "Books", with "First edition" etc., are actually auction catalogues, two quite different beasts to my mind. Would anyone have the prices-realized list of the auction by Santamaria, auction , Milan, 24 January 1938? A copy would be really useful to me. And an annotated copy with buyers' names even more!! Can anyone provide information on this token? The best that I can make out with it is its reverse - GOOD FOR / HALF / DIME. The device on the front looks familiar, but I can't place it. Most of the lettering on the front is illegible. 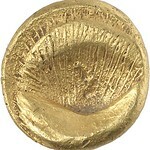 I have checked Rulau and the Token Database, but have not had any luck. Thus far the feedback that I've received from David Schenkman and Steve Hayden is that it's probably from the St. Louis area, pre-Civil war. Eric Schena noted that there's similar piece listed by Rulau (T.L. Rives) that shares a similar reverse denomination. Any help would be appreciated. I have a set of the American Journal of Numismatics but the bindings are shot and the set needs rebinding due to leather turning to dust. Do you have any suggestions as to who I should get a price from for rebinding? I was thinking your readers might be interested in a contest Littleton Coin is running, we are looking for people to tell their “collecting story” in a short video clip. There are three great LCC gift card prizes for the top 3 (1st place is $500, 2nd gets $250 gift card, 3rd gets $100). Who helped you get started... What was your favorite find? Perhaps you inherited a set of coins from a parent or grandparent. Learned to collect from an aunt or uncle or are passing along your collecting knowledge to the next generation yourself. No matter how, when or why you collect, we want to know... What’s your collecting story? Simply upload a video (2 minutes maximum in length) that illustrates your collecting experience. The videos will be placed on our collecting story shared board. Receive likes from fellow collectors, your friends and family. On or about March 11, 2016, the Promotion Administrator and Littleton Coin panel of judges will decide on the winning video entries. 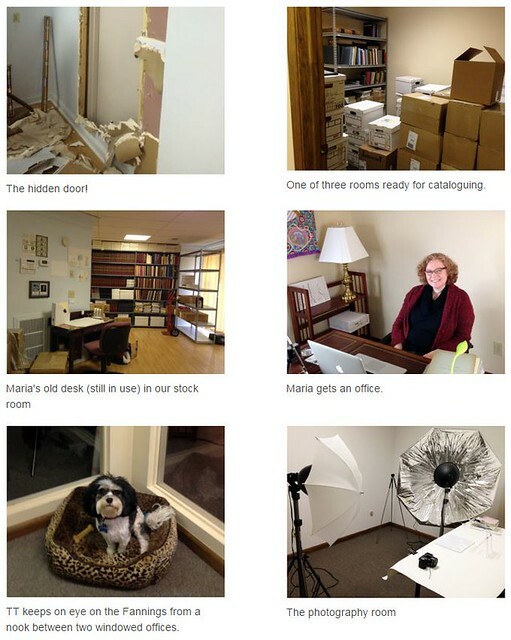 The winning entrants will be selected by our panel of judges, with consideration given to the number of online votes received on the Collector Stories Video Contest page during the promotional period. 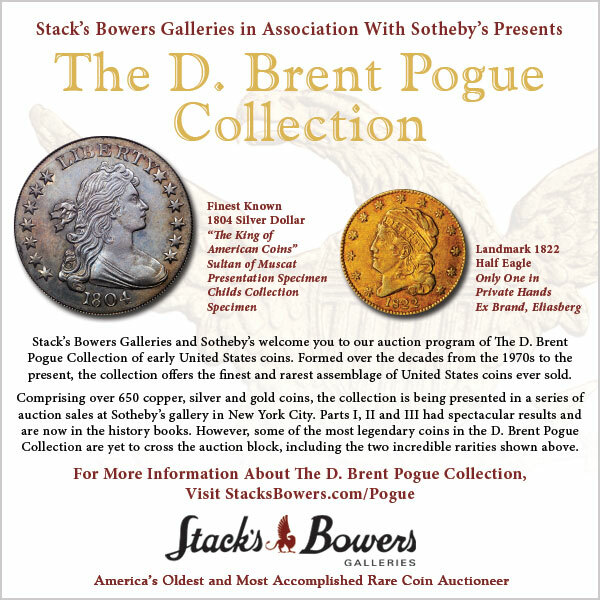 Nice coverage of the Pogue 1815 half eagle in the last issue of the E-Sylum. 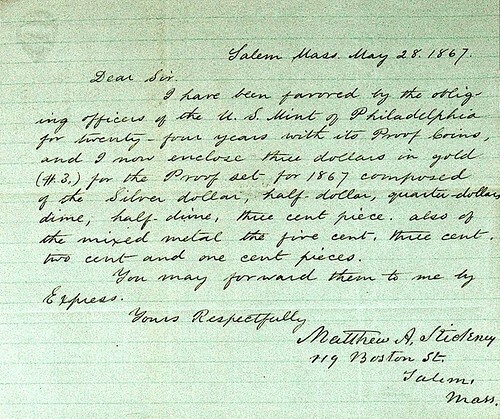 Students of the 1815 half eagle might be interested in this transcript of an 1851-dated letter I recently located in Matthew Stickney’s papers at the Peabody Essex Museum, in Salem, Massachusetts. 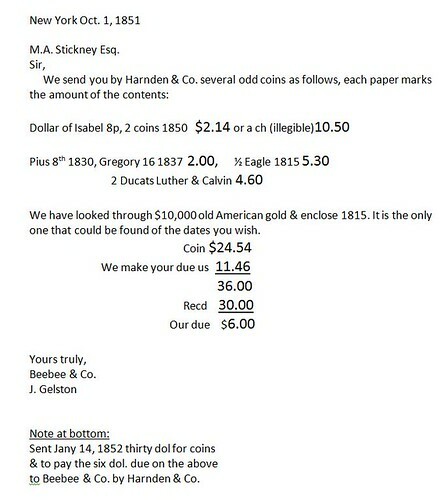 The letter is from New York bullion and exchange brokers Beebee & Co. to Stickney, offering him a number of foreign coins and an 1815 half eagle. 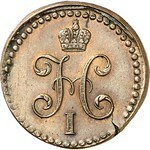 Stickney obtained many coins from Beebee & Co. (or Beebee & Parshall’s, Beebee, Ludlow & Co., name changes periodically) in the period before 1854. From the context of the letter, it seems he had a standing want-list with them and they also sent him interesting coins they came across on spec. It is interesting to note that Stickney was actively seeking the 1815 before 1851, as many numismatists were not aware of the issue at that time. Joseph Mickley still believed no half eagles had been struck in 1815 when he wrote his pamphlet United States Coins and Their Degrees of Rarity in 1858. 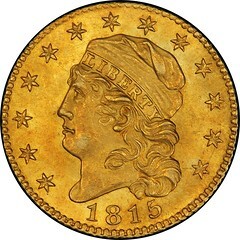 Stickney’s 1851 purchase makes him the earliest-known numismatic owner of an 1815 in this country, although Swedish merchant Carl Scharp had acquired an example for his collection at an earlier date. 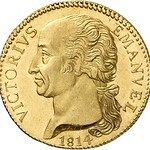 He paid only bullion price for the coin, as it was an old-tenor gold piece with slightly higher gold content than half eagles struck after 1834. Beebee & Co. was a prominent Wall Street firm, and the largest dealer in gold bullion in this country in the 1840s and 1850s. Harnden & Co. was one of the first independent express companies in the U.S., founded in 1839 by William Frederick Harnden. It was later merged with other entities to form the more famous Adams Express, headed by Alvin Adams. I stumbled upon this article on B. Max Mehl in my internet travels and thought it might be interesting to E-Sylum readers. The website seems to be all about the history and architecture of Ft. Worth and gives a nice overview of B. Max Mehl’s life and career. The article is called “Once Upon a Penny: The House That Pocket Change Built” and there are many great photos, including one of him as a child. Some of his fellow numismatists considered him to be the P. T. Barnum of coin collecting. But they also admitted that at a time when coin collecting was a hobby of the well-to-do, Benjamin Maximillian Mehl (1884-1957) did more than anyone else to make coin collecting popular among average Americans. 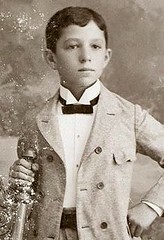 Max Mehl was born in Russia and came to Fort Worth with his family at age twelve. His father and brothers were in the clothing business. 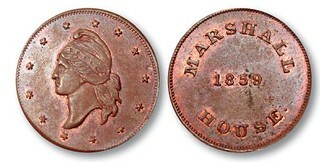 Max began buying and selling coins, working out of his family’s home on East 2nd Street. 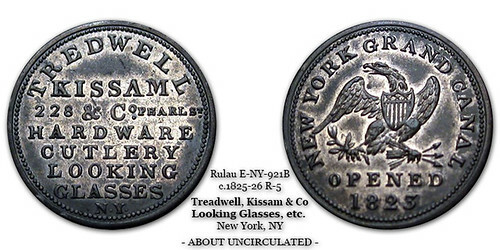 In 1903 his first ad appeared in The Numismatist magazine. Mehl began placing small classified ads in the Fort Worth Telegram in 1904. He was twenty years old. 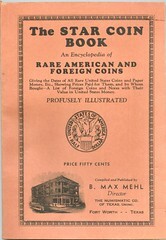 Also in 1904 Mehl began selling his Star Coin Book, which listed prices he paid for coins. (The book was published annually for sixty-one years. I found this 1930 edition on eBay.) In 1906 he gave up his day job—clerking in his family’s shoe store—and rented an office on South Main. Max Mehl the numismatist was on his way. Mehl built his business a nickel and a dime at a time. 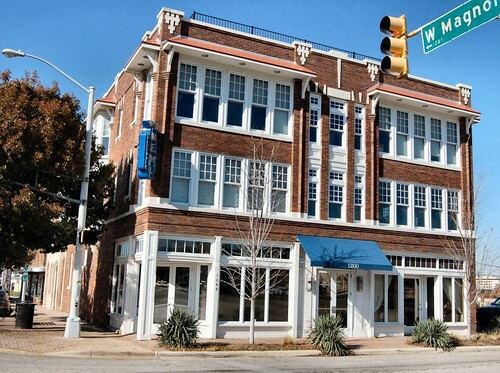 A lot of nickels and dimes: By 1916, when he was only thirty-two, he commissioned architect Wiley Clarkson (himself only thirty-one) to design an office building on Magnolia Avenue, across from Magnolia Centre. “The largest and finest appointed exclusive numismatic offices in the world,” Mehl called it. What fun Clarkson must have had with the design. 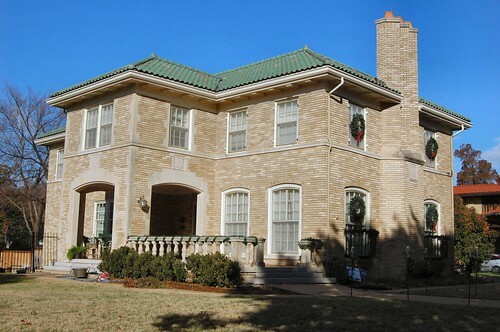 The cast stone of the south facade features coins above the windows and doors. An image of the building, with streetcar passing, appeared on the cover of every edition of his Star Coin Book. Mehl was a marketing whiz. He advertised heavily in numismatist magazines, was the first numismatist to advertise in magazines for a general readership, was an early user of radio commercials. His mail order business boomed. The Star-Telegram once reported that in 1910 mail addressed to Mehl accounted for more than half the traffic of the Fort Worth postal system. He once reportedly received seventy-two thousand pieces of mail in a single day. By 1924 his advertising budget was $50,000 a year—in 1924 dollars. In 1931 Mehl spent $18,500 for a single ad in American Weekly Sunday magazine. But as Mehl was bringing coin collecting to the masses, he was not ignoring the high rollers. Among his customers were Amon Carter, Winston Churchill, Franklin D. Roosevelt, and Egypt’s King Farouk. 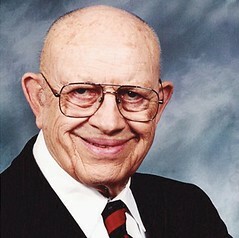 After reading the article about coin dealer B. Max Mehl, I went to a website I often use while researching - www.findagrave.com - to see Mehl's grave marker. Interestingly, the volunteer who created the Find-a-Grave memorial took the time to read Mehl's Texas death certificate. The 28 Sep 1957 date matches what was in Pete Smith's article; however, the date on the cast bronze marker is 27 Sep 1957. That type of error is not terribly unusual because the order for the marker is usually done some time after the death, and the person placing the order may be going from memory when providing dates. Watkins, Benjamin H. (1752-1828), was born on April 28, 1752 at New Castle, Rockingham, New Hampshire, son of Captain Andrew Watkins (1722-?) and Jane Frost (1725-1790). Like his father he was a seaman from his youth and later in life became a dry goods merchant at Salem. It seems highly tenable that the young Watkins or his father Captain Andrew Watkins purveyed coins from distant lands for Rev. Bentley (q.v. ), the Unitarian Minister at Salem. He was an antiquary and collector of books, coins, engravings and curiosities. He died in January 25, 1828 at his home on Marlborough Street, Salem, Massachusetts. His goods sold at auction about six months after his demise by the estate administrator Thomas Odell. 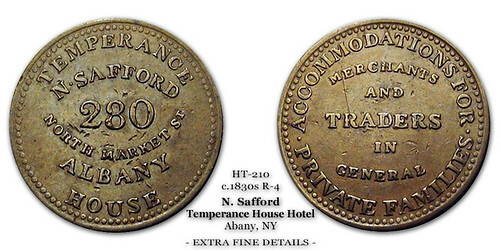 His collection sold for about $1,000.00 on June 12, 1828 at auction by George Nichols, and is the first listed in E. J. Attinelli's Numisgraphics (New York, 1876). At the time of his death his coin collection consisted of 350 ancient coins, two Massachusetts NE shillings, two Massachusetts twopence pieces, and one Massachusetts threepence. 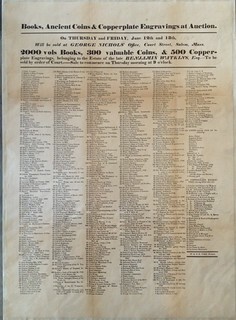 The catalog was drawn up by John H. Nichols, the seventeen-year-old son of the auctioneer. Young Mr. Nichols purchased some of the coins himself forming a collection which he retained into the late 1870’s. Attinelli was assisted in gathering this information from Dr. Wheatland and young Mr. Nichols, now an elderly man in his mid to late 60’s. Pursuing his own interests and satisfying his curiosity, geologist and adventurer George W. Featherstonhaugh visited the private Bechtler Mint in Rutherfordton, N.C., in 1837. He penned this account later published in two volumes whimsically titled A Canoe Voyage Up the Minnay Sotor. Quite a few years ago I bought these copies. The other day, more or less by chance, I came across the text on the Internet. “After breakfast I walked a few miles to visit a German of the name of [Christopher] Bechtler. I passed a great part of the day with him at his cottage in the woods. He had resided seven years in this country and had established for himself a character for integrity as well as skill in his profession. I found him rather mystical and imaginative, as many Germans are. “The greater part of the small streams in this part of the gold region have more or less gold in them. Bechtler had obtained some in the usual manner, and having made a die, coined his gold into five dollar pieces. 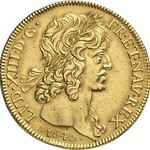 At the period of my visit his gold coin circulated more freely than that of the United States, which were very scarce. “I never was so pleased with observing transactions of business as those I saw at his house during the time I was there. Several country people came in with rough gold to be left for coinage. He waited before them and entered it in his book, where there was marginal room for noting the subsequent assay. An extremely rare and valuable silver coin dating back to the founding of the United States has gone on display in Prague’s National Museum. 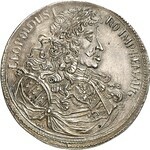 The so-called Flowing Hair silver dollar is on a four day stopover in Prague as part of a wider European tour. The coin, which dates back to the year 1794 and the presidency of George Washington, represents the first formal manifestation of US currency following the establishment of the United States Mint two years earlier. 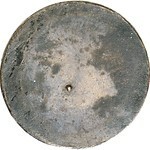 It has a diameter of four centimetres, weighs 27 grams, and is 90 percent silver and 10 percent copper. On one side is a depiction of the goddess Liberty, hair flowing in the wind, and on the other an eagle surrounded by a wreath. Only around 2,000 were ever minted, with only a handful surviving to this day. The coin is even rarer because of its pristine condition; it is also believed to be the very first coin ever struck by the Mint. The silver dollar was bought by collectors Legend Numismatics for USD 10 million in 2013, making it the most valuable coin ever sold. During February, the Flowing Hair silver dollar will be embarking on an eight-nation tour. The first stop is Prague’s National Museum, where it will be on display in the museum’s New Building until this Friday, February 10, from 10 am to 8 pm. Four years ago, this museum displayed what was then the most expensive coin in the world, namely a US 1933 gold Double Eagle. 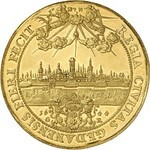 After that, the 1794 coin travels on to Warsaw, Poland; Tallinn, Estonia; Helsinki, Finland; Stockholm, Sweden; Oslo, Norway; Dublin, Ireland; and finally London, England. Accompanying the exhibition, which is free to the public, is an original copy of the US Declaration of Independence. 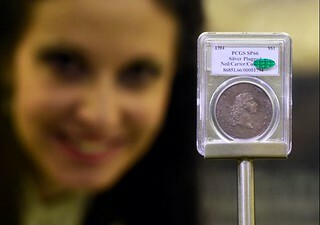 The world's most expensive coin, a 1794 Flowing Hair silver dollar that some believe was the first of its kind struck by the U.S. Mint, is traveling on an eight-nation European tour in February. 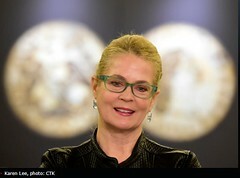 The $10 million+ coin is making its first stop Feb. 9 to 12 at the New Building of the National Museum in Prague, Czech Republic. The coin will eventually be publicly displayed in Warsaw, Poland; Tallinn, Estonia; Helsinki, Finland; Stockholm, Sweden; Oslo, Norway; Dublin, Ireland; and London, England. 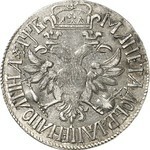 It is the only 1794 silver dollar that was struck with a silver plug in its center. 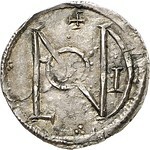 The exhibition, with the coin to be displayed alongside an original copy of the Declaration of Independence, is being staged by Samlerhuset Group B.V. 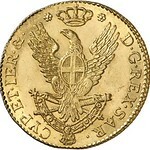 The same entity spearheaded the 2012 multination European tour of one of two 1933 Saint-Gaudens gold $20 double eagles from the National Numismatic Collection at the Smithsonian Institution's Museum of American History. 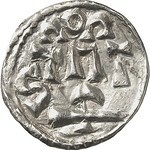 Samlerhuset Group B.V. is a global numismatic marketing firm headquartered in Almere, Netherlands, selling coins, commemorative pieces and related collectibles. 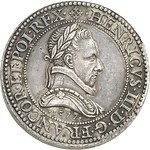 The firm, which markets numismatic items into more than 16 different countries, is half owner of the Royal Norwegian Mint and part owner of the World Coin Fair in Berlin. Opening on Feb. 12, the exhibit showcases the wide range of numismatic objects and memorabilia honoring the Olympic Games from their ancient beginnings to the modern revival. The exhibit runs through March 2017.
Notable artifacts on display include rare Syracusan dekadrachms (Greek coins) from the sixth century B.C. 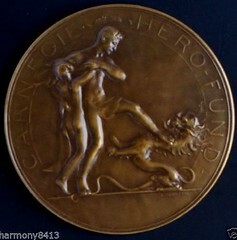 designed by two of the most celebrated engravers of the ancient world; a 1936 Berlin Summer Olympics bronze medallion designed by the famed Karl Goetz; a complete set of award medals from the 1996 Atlanta Summer Olympics and 2002 Salt Lake City Winter Olympics courtesy of the U.S. Olympic Committee; plus participation medals, torches and even a few mascots. The first recorded Olympic Games took place in 776 B.C. in ancient Olympia to honor Zeus, Greek god and father of the pantheon. The Olympics were held every four years (as they are today), an interval known as an Olympiad. The ancient Games differ from their modern incarnation, but they encouraged a spirit of peaceful international competition that became the core of the modern Olympic ideal. An international truce was announced before and during each of the festivals to allow visitors to travel safely to Olympia. Wars were suspended, armies were prohibited from entering the area or threatening the Games, and legal disputes and carrying out death penalties was forbidden. 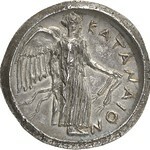 The first coins related to the Olympic Games were struck around 500 B.C. by Greek city-states and continued to be issued until 146 B.C., when Greek cities lost their independence to the growing Roman Empire. The ancient Games were discontinued in A.D. 393 by the Christian Roman emperor Theodosius, who viewed them as pagan observances. The Olympic Games were revived in 1896 and have become the world’s largest celebration of athletic skill and competitive spirit. 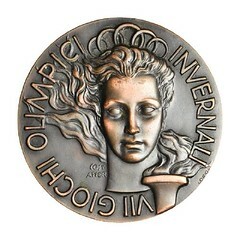 Since the modern revival, medals have been struck by host and participant nations in remembrance of the Games and competitions. 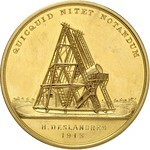 Commemorative coins have been struck beginning in 1951. The Money Museum includes an extensive and ever-growing collection of historical numismatic treasures. This one-of-a-kind facility showcases some of the most valuable and significant numismatic items the public cannot see anywhere else. Rarities include a 1913 Liberty Head nickel valued at $2 million and two of the 15 known 1804 dollars valued together at $6 million. 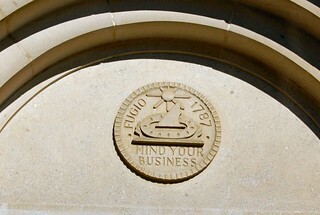 The Money Museum is located at 818 N. Cascade Ave, adjacent to the campus of Colorado College and next door to the Colorado Springs Fine Arts Center. Museum hours of operation are Tuesday-Saturday, 10:30 am-5 pm. Admission is $5 ($4 for seniors, military and students). Kids 12 and under are free. 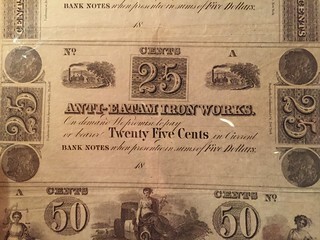 For more information, call 719-632-2646 or visit www.money.org/money-museum. Numismatic Guaranty Corporation (NGC) has graded an 1855 Peruvian Pattern 2 Peso in gold that was the first pattern struck by the United States Mint for a foreign country. “Patterns” are sample coins that were struck to test a new design, composition, denomination or other new feature. They were typically struck in extremely small numbers for test and display purposes. The Peru 1855 Pattern 2 Peso came about during a turbulent time in that country’s early history. After it gained its independence from Spain in 1824, Peru became part of a short-lived confederation comprised of three states: North Peru, South Peru, and Bolivia. This ended with the War of Confederation in 1839, which resulted in the separate countries of a unified Peru and Bolivia. After two wars and many internal political issues, Peru faced several serious economic problems. During these wars, many merchants and businessmen had fled the newly founded country, taking with them their wealth. Money shortages developed as a result—any coins that remained in the country were hoarded and a lack of production at silver mines within Peru prevented new coins from being struck. The shortage of coins resulted in the use of Bolivian coinage, which had lower silver content than the Spanish coinage upon which Peru’s economic system had been developed, causing confusion and price instability. Peru subsequently opened more mints within its borders – at Cusco, Cerro de Pasco, and Arequipa – to create solid Peruvian money based off of the old Spanish weights and purities. 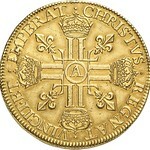 A decision was made, however, to transition the coinage system from the Spanish octal (e.g. 8 Reales) system to the decimal system. The United States made pattern coinage samples for Peru, hoping to receive a contract for the production of Peruvian coinage. 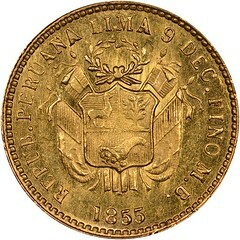 The Peru 1855 2 Peso struck in gold was minted at the Philadelphia Mint, three years prior to the anticipated transition to the decimal system in 1858. 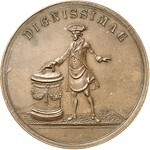 Other decimal coinage was struck at Philadelphia in the hopes of obtaining the coinage contract. 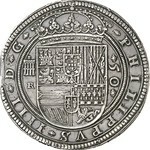 Peru, however, opted to continue to produce its own coinage and even modernized the Lima Mint with new steam minting machines from England to replace the aging Spanish colonial equipment. It would be 1863 when Peru finally transitioned to a new system, with the Sol as the replacement for the Spanish peso. 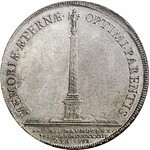 A peso was initially valued at 0.8 soles. The Peru 1855 Gold Pattern 2 Peso is important in the numismatic histories of both the United States and Peru. While the United States had previously produced issues that circulated overseas, this was the first pattern coinage struck at the Philadelphia Mint for a foreign country. This was done before Congress revoked the legal tender status of the Spanish 8 Reales in the Coinage Act of 1857, and it would not be until 1874 when Congress explicitly authorized the United States Mint to contract to manufacture coins for foreign governments (provided that these contracts did not interfere with the required coinage of the United States). For Peru, it marked a transition in their economic history which took years to complete. Ultimately, the foresight that economic reform was needed for financial stability proved to be correct. 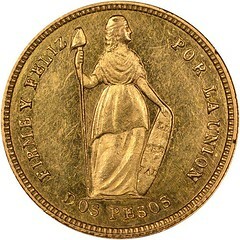 The Philadelphia Mint is believed to have struck only six examples of the Peru 1855 Gold Pattern 2 Peso. 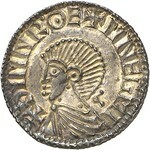 Of these, NGC has certified two, this example being graded NGC PF 62. The other, formerly from the collection of King Farouk, was graded NGC PF 63. 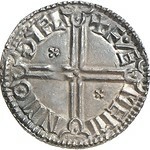 A third example is in the National Numismatic Collection of the Smithsonian Museum and the other three examples are not publicly known today. 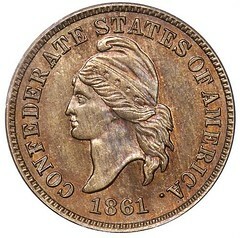 The sub-title to Scott Rubin’s remarkable article in the January 2016 issue of The Numismatist, entitled “The Discovery of the Original Confederate Cent,” is revealing: “With the help of vintage auction catalogs, a numismatist pieces together the story behind this 19th-century rarity.” Scott has been acquiring American coin auction sale catalogues for over five decades and has one of the most extensive collections ever formed. Dating from the mid-nineteenth century to date, Scott has amassed over 10,500 catalogues. 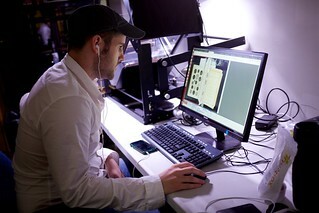 More importantly, he has searched through them all and has organized the results of his findings. 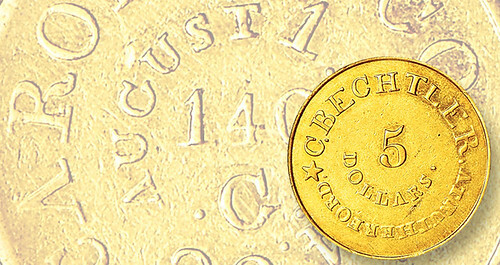 For years, major American coin auction firms have relied on Scott’s statistics and research to enhance their descriptions of rare American coins. Recently, Scott came across a description in an 1891 auction catalogue that he had not before noticed. It revealed how a fabled rarity “became available to the collecting public and who was involved.” The article is a must-read. Note to Debbie: When you decide on a date and time, David and George will be there with the truck. Look for more articles from P. Scott Rubin on these 19th-century catalogues in upcoming issues of The Asylum. The story of the creation and discovery of the Confederate cent is one of the most misunderstood in numismatics. 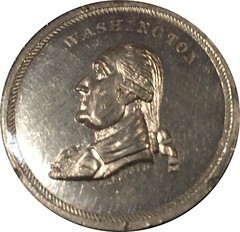 Dated 1861, the first year of the American Civil War, the coin is the same size and appears to be the same composition as the U.S. Indian Head cent of the same year. 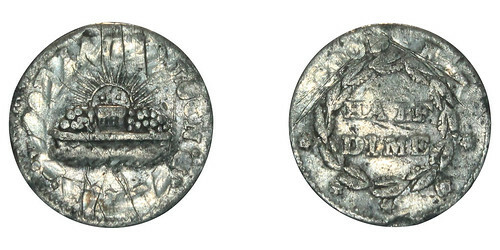 The coin’s obverse image of Liberty (sometimes called “French Liberty”) is unlike that on any cent circulated by the United States; however, it is identical to the image used by die-sinker Robert Lovett Jr. (1824-79) to create trade tokens he made for himself and coin dealer William Idler (1808-1901). The obverse also bears the legend CONFEDERATE STATES OF AMERICA. The reverse displays a wreath of corn, cotton and tobacco, with two barrels and a cotton bale along the bottom. Within the wreath is the denomination, 1 CENT. The letter “L” on the bale identifies Lovett as the designer. 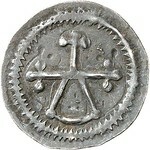 The coin was struck in “medal turn” (side-to-side rotation) as opposed to the standard “coin turn” (top-to-bottom rotation). 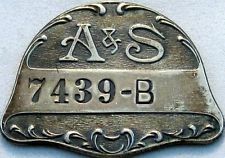 As far as we know, the coins’ connection with the Confederate government is undocumented. 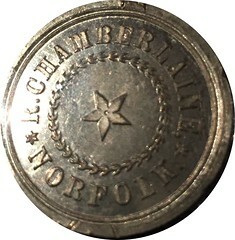 It has been speculated that Lovett, who had done work for Bailey & Company of Philadelphia, had been asked to create dies for a proposed cent coinage for the Confederacy through the Pennsylvania firm. Again, no documentation exists to support this assumption. I believe one of two events prompted Lovett to produce the Confederate cent: either he was contacted by a Southern sympathizer, or he thought he could entice the Confederate government to purchase dies for a cent coinage. Copper token produced in 1859 by Robert Lovett Jr.
Numismatist John W. Haseltine (1838-1925) took credit for discovering the Confederate cent, and mentioned that Lovett had inadvertently spent one at a tavern in Philadelphia. However, he never provided concrete details of either claim. Interestingly, numismatic auction catalogs provide the most accurate information about the Confederate cent and its discovery. Two sales in particular—Haseltine’s auction on January 13-15, 1874 (Lot 665) and S.H. & H. Chapman’s auction on November 27-28, 1891 (Lot 823)—reveal how the coin became available to the collecting public and who was involved. The catalog for the latter describes the true discovery of the Confederate cent and indicates Haseltine had nothing to do with it. [Lot] 665 1861; head of Liberty; inscription, “Confederate States of America; rev., “1 Cent,” in 2 lines, surrounded by a Wreath of ears of corn and wheat, with a cotton bale at the bottom; nickel; very fine; excessively rare. [The dies for the above piece were made by Mr. Lovett, of Philadelphia, In 1861. Mr. Lovett says that they were ordered in 1861, for the South, and that the dies were delivered. Previous to delivering the dies, he struck twelve pieces, but showed them to no one and kept the matter quiet, fearing that he might be arrested if it were known. It was not until about six months since Mr. Lovett parted with all he had (either ten or twelve) to Dr. E. Maris, of Philadelphia, from whom this one was obtained. 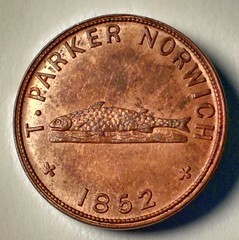 In the fourth edition of the Standard Catalog of United States Tokens 1700-1900, Russell Rulau attributes a token inscribed T. PARKER NORWICH to Norwich, Connecticut. 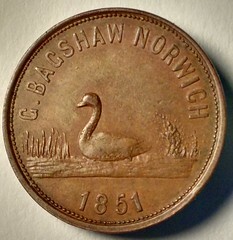 I am working with a collection that has one of these tokens, and also has a similar token inscribed G. BAGSHAW NORWICH. 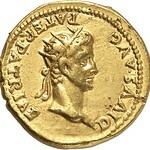 Today, given the appearance of two similar tokens, I must also disagree with Rulau, and agree with Fauver. 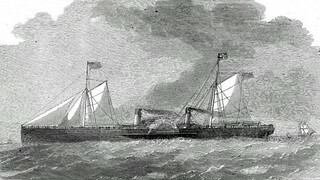 The names of Parker and Bagshaw both appear in Francis White’s History, Gazetteer, and Directory, of Norfolk, and the City and County of the City of Norwich … that was published in Sheffield, England in 1854. G. Bagshaw appears on page 147 as a fishmonger and Thomas Parker appears on page 190 of the same directory, also as a fishmonger. There is no doubt in my mind that these tokens should be correctly recognized as English tokens. Show attendees are also invited to attend the ANA’s free Money Talks lectures. The informative 30- to 45-minute programs are presented by some of the hobby's most noted authorities. Presentations are offered Friday and Saturday, March 4-5, 2016, in Room 302, of the Kay Bailey Hutchison Convention Center. "Don't miss out on these interesting and fun presentations," said Susan McMillan, ANA seminar director. "Our speakers are knowledgeable and enthusiastic about a wide range of subjects and want to share their insights with you." • 9 a.m. – “The History of the Double Mint Set: 1942-1958” by Leo Frese. Learn important information on the origination of the Double Mint Set. Prior to April of 2014, collectors and dealers alike believed Double Mint Sets were first issued by the Treasury Department in 1947. A unique group of canvas bagged sets issued prior to 1947 will be displayed. • 10 a.m. – “The Rise and Fall of Rome’s Money and what it Means for America Today” by Patrick A. Heller. 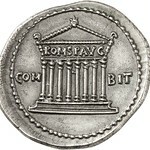 The rise and decline of Rome’s monetary system closely parallels the political rise and fall of the city. Further, there are significant parallels with the rise and fall of the American monetary system. • 11 a.m. – “The Untold Story of ‘In God We Trust’ and its Ties to the National Anthem” by Michael Fuljenz. In God We Trust has withstood a long line of legal challenges to appear on our money and on government-owned property. The patriotic motto first appeared on U.S. coins at the time of the Civil War, but it actually was inspired by events during the War of 1812. • 12 p.m. – “The Newman Numismatic Portal: A Case Study in Online Numismatic Research” by Leonard Augsburger. 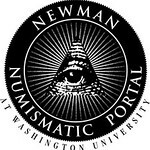 The Newman Numismatic Portal, administered through Washington University in St. Louis, was launched in 2014 with a grant from Eric P. Newman. 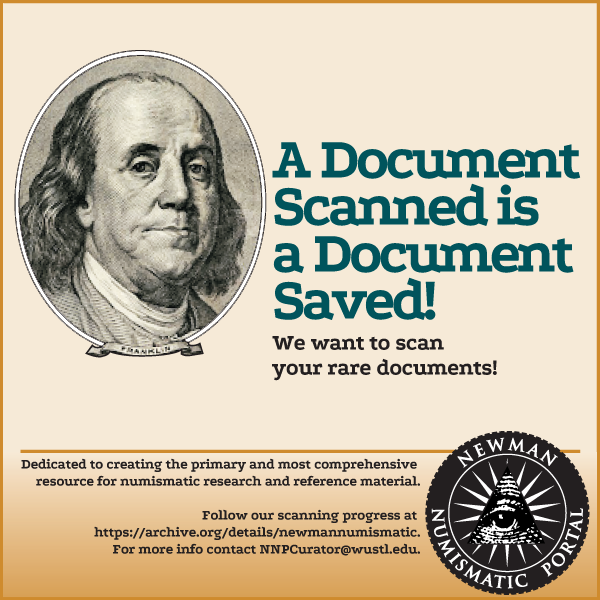 The Portal scans out-of-print numismatic literature, which it makes available on a free and forever basis to the numismatic community. This presentation will highlight materials in the Portal. • 1 p.m. – “Olympic Games: History and Numismatics” by Douglas Mudd. This new exhibit at the ANA's Edward C. Rochette Money Museum covers the history of the Olympic Games from ancient times to the modern. The exhibit features Olympic collectibles of all sorts, with a focus on numismatic items and their importance to the Games. Highlights include Olympic award medals, a complete set of participation medals, four dekadrachms of Syracuse, and the outfit that Tara Lipinski wore in a gold-medal winning performance. • 2 p.m. – “Demystifying VAM Collecting” by John Baumgart. A moderated panel discussion by experts in the VAM collecting field, who will give a brief introduction to silver dollar variety collecting and answer questions from the audience about everything you've wanted to know about VAM collecting. • 3 p.m. – “Bringing Numismatics into to the Mainstream” by James P. Bevill. Hundreds of museums in the USA are routinely looking for temporary exhibits that they can rotate through their facilities. Many of them may be open to a well prepared numismatic exhibit that can serve to compliment the museum's other holdings. Bevill will share his experience in pitching the concept of a numismatic exhibit to museum directors and working with the curatorial staff on design, layout, object selection, labeling, narratives, consignments, display, lighting, security and insurance. 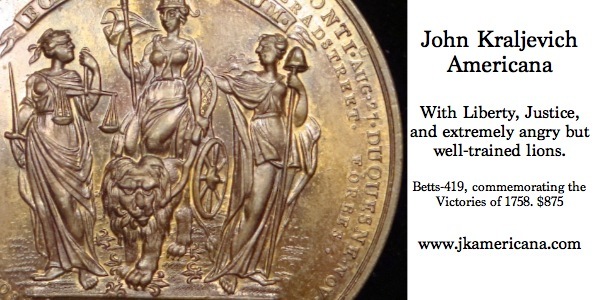 • 4 p.m. – “An Overview of European Cathedral Medals by Jacques Wiener” by David Schmidt. 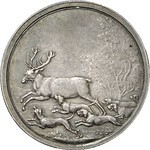 Jacques Wiener came from a family of Belgian medalists and engravers from the mid-1800's. 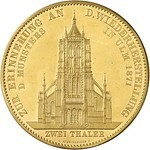 His medals, depicting 41 famed cathedrals of Europe set a new standard of interior and exterior details. 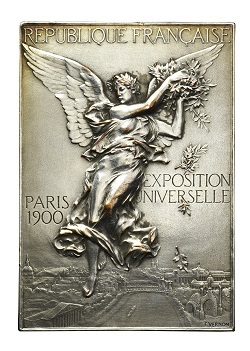 Known as "architectural medals," all those in Schmidt’s possession will be on display. • 9 a.m. – “The Aurum: A New Type of Money in the Nanotechnology Age” by Adam Trexler. The Aurum® is the smallest precise, verifiable unit of gold available on the world market today. Using a proprietary process, very thin and precise quantities of gold are accumulated between layers of polyester film. On a standard 1/10 gram Aurum, the gold is 404nm thick, approximately one percent of the width of a human hair. 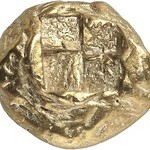 The result is a new, beautiful way to use gold for artistic, commemorative and branding purposes. • 10 a.m. – “Laura Gardin Fraser: Coin Designer, Medalist and Sculptor” by Carl Stang. Laura Gardin Fraser is one of the more talented coin designers and medalists of the 20th century having designed several Early U.S. Commemorative Coins, foreign commemorative coins and a multitude of medals. She was also one of the more talented sculptors of the century. • 11 a.m. – “Smart Coin Conservation” by Alvin L. Stern. A truly important program outlining past and present materials/procedures involved in the cleaning, conserving, and preserving of metal coins. This talk will give both the collector, and dealer insight from basic do’s and don’ts to advanced technology in handling your coin’s conservation in a professional manner. • 12 p.m. – “Full Step Jefferson Nickels: Interesting, Collectable and Profitable” by Stephen E. Parker. Jefferson Nickels (or Jefferson’s) have a picture of Monticello on the reverse, with are six steps leading up to the house. The industry counts five complete steps as “Full Steps.” Some years the steps are complete. Many years the steps are literally non-existent. Come find out what makes these Jefferson’s interesting, collectable and profitable. • 1 p.m. – “From Texas to the Moon with John Leonard Riddell” by Michael E. Marotta. Expanding his article in The Numismatist (“The Riddle of J.L. Riddell,” April 2014), Marotta will pay tribute to John Leonard Riddell, the chief melter at the New Orleans Mint. 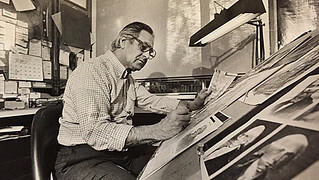 Among his many accomplishments, Riddell was the first working scientist to write a science-fiction story. • 2 p.m. – “My Top Ten Buffalo Nickel Varieties” by David O. Elliott. Join David Elliott for a fun review of "bison vs. buffalo" terminology, as well as an overview of the designer James Earle Fraser’s artistic roots and historical origin of the Indian head/ Buffalo nickel. Elliott delves into popular varieties, such as doubled-die obverses and reverses; overdates; abraded dies; and over-mintmarks. • 3 p.m. – “The Real Value of Money” by Terry Poulos. Net Zero Coin challenges observers to solve an equation to derive “face value.” This educational “conjoined numismatic” is paired with a brass card, both with matching limited edition numbers. NZC aims to ameliorate complexities surrounding “full faith and credit” currencies, specifically spot-price versus face value worth. Show hours are 10 a.m. to 5:30 p.m. on Thursday, March 3 and Friday, March 4, and 10 a.m. to 4 p.m. on Saturday, March 5. General admission is $8. Admission is free on Saturday, March 5. Admission is always free for ANA members and children under 12. 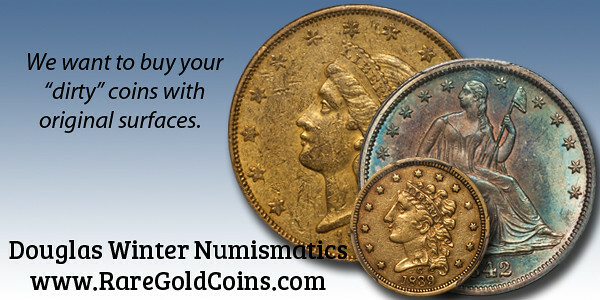 A $2 discount coupon for non-members is available online at www.NationalMoneyShow.com. An additional benefit of membership is the ability to enter the show 30 minutes before the public on Friday, March 4 and Saturday, March 5. 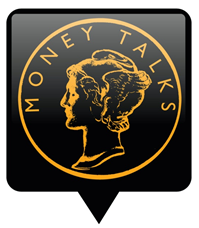 Proposals for Money Talks at the American Numismatic Association's World's Fair of Money in Anaheim on Aug. 9-13, 2016, are being accepted and can be submitted at Money.org/MoneyTalks, or by contacting Susan McMillan at McMillan@Money.org or 719-482-9850. Now after giving you some of the background let me bring you further up to date on efforts to deal with counterfeiting. Even after all the government’s attempts to stop them, counterfeiters continued to make gold coins and there were items already in the U.S. market. Collectors could be taken in by counterfeit gold coins and not know where to take them for verification. Not everyone lived near or had access to dealers with the knowledge and qualifications to help. 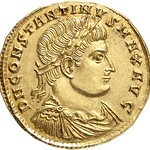 Counterfeits continued to be offered by promoters and jewelers as "bargain priced coins." 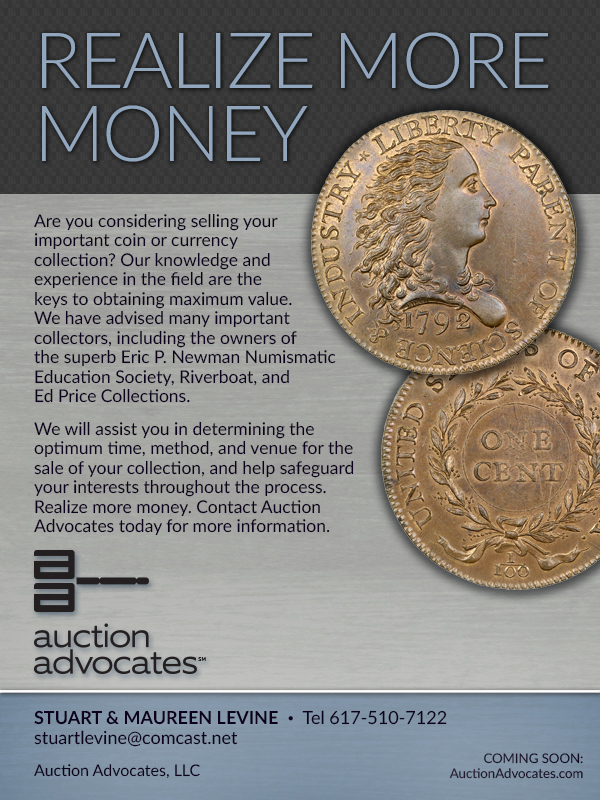 Because of this the American Numismatic Association, the largest coin collector association in the world at that time, called together a group of over 50 dealers to meet at their headquarters in Colorado Springs, Colorado, to address the situation. Discussions were held to determine what actions these leading dealers could suggest to educate numismatists and stop counterfeiting and its negative effects on the hobby. As a result of that meeting the American Numismatic Association Certification Service (ANACS) was created, which would, for a small fee, examine submitted coins and verify them as genuine. Those “certified” as genuine would be photographed, the photo and the coin were sent back to the collector, and a copy of the picture was placed in ANA files. At the same meeting it was decided by the ANA to adopt numerical grading, a system using adjectival and numerical grading. This system would follow an already accepted system that had been established for large cents in a 1949 (revised in 1954) book by Dr. William Sheldon, a noted expert on United States copper coins. 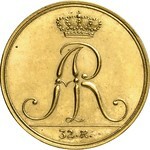 The photographic record made by the ANA was flawed, as the photo was not attached in any way to the graded and verified coin, and the photo could be “switched” to a coin that resembled the one in the photo. This made it impossible to guarantee that the “authentications” were not being used for counterfeits, altered coins, cleaned and polished coins and others that were false, or doctored. Thus, the “Scammers” still had a field day. 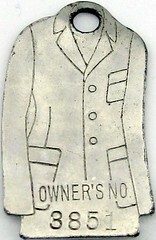 Third-party grading services were born in the mid 1980s to provide both authentication and grading of coins, with the additional service of placing the coins in sealed plastic holders called "slabs.” Over the years this has grown to become a standard practice in the hobby, with a tremendous effect on the numismatic marketplace. Some people think that third-party grading and “slabbing” have had a detrimental effect, resulting in a market that is overly dependent on what some consider to be arbitrary opinions at the grading services. In addition, many millions of coins have been “slabbed” and in some cases coins “reslabbed,” with the hope that the value of the coins can be increased if a better grade can be achieved. The grading provided by the grading services will always be the subject of debate. In all the years that I have been active in numismatics I learned from experience that the grade of a coin is in the eye of the beholder. But it is important to recognize the essential role that grading services play in providing authentication for collectors who might otherwise be the victims of counterfeiters and other scammers. These grading services and their staffs of qualified experts give collectors, especially those just starting out, the confidence that the items being purchased are not counterfeit, false, or in some other way a misrepresentation. Its...Charge Coins. We must confess we have never cared for Charge Coins. Mostly this was based on ignorance as in our 30 plus years as a exonumia dealer we have only handled 20 or 30 of the most common and boring examples. Other than when they were the hottest thing, around 20 years ago, almost no one ever asks for them. But we are open minded and when we got the chance to buy Steve Alpert's collection, we had to investigate. Steve literally wrote the book on the subject and built the most extensive collection ever. Charge Coins were the forerunners of our current Credit Cards used as an easy way to extend credit to pre-approved customers. They were issued by department stores and other retail and service businesses beginning in the late 19th century. The typical example will have the customer's credit account number on one side and a business logo on the other. Frequently they were issued holed to facilitate attachment to a key ring, fob or necklace. 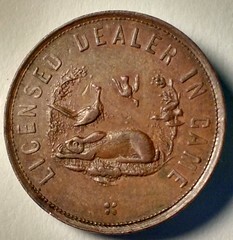 A wide range of businesses issued these tokens, aside from department stores many were also used by clothing, shoe and jewelry stores. Still others were issued by taxicab, hotel, restaurant, nightclub and car rental concerns. 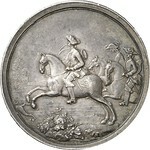 Although Pennsylvania Charge Coins are the most numerous, followed distantly by New York, many other geographical areas are represented. In the Alpert book additional pieces are listed from California, Colorado, Delaware, Georgia, Illinois, Maryland, Massachusetts, Michigan, Minnesota, Missouri, New Jersey, Ohio, Rhode Island, Texas, Wisconsin and the District of Columbia along with a number of others states represented by just one or two examples. Odd shapes are almost the norm and while many are oval others have fancy flourishes added to a basic shape and still others are figural in nature in forms such as shirts, coats, hats, keys, shoes, etc. The Alpert collection has nearly 700 different examples and while there are a few common issues, the vast majority are quite scarce to rare. These will all be sold on eBay over the next year. 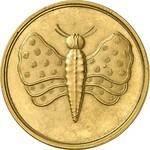 There are already 20 up for auction in our new Charge Coin category with new pieces planed each day. 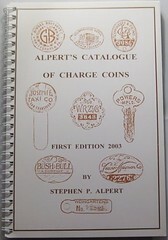 We even have a limited supply of Alpert's Charge Coin Book for those interested. 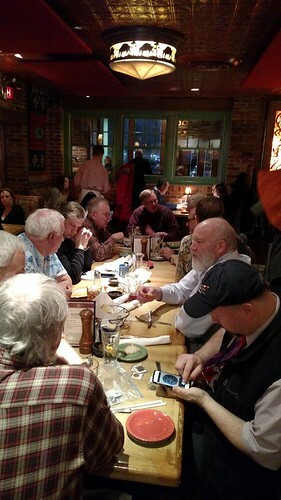 My northern Virginia numismatic social group Nummis Nova normally meets on the 2nd Tuesday of the month, but some forecasted bad weather caused a postponement to Wednesday. So it was Wednesday that I headed to a Tex-Mex restaurant called Silverado in Annandale. Steve Bishop and Tom Kays were our hosts. I was the first one to arrive and took a seat in the bar and ordered a cold one. Before long Dave Schenkman joined me, and shortly afterward Eric Schena arrived as well and we were able to get seated at our table in the next room. The three of us sat around one end because we hadn't been able to talk much due to the seating arrangements the month before. Howard Daniel was one of the next to arrive. He's been in Vietnam for months, and this was his first meeting since his return. He had with him a nice scroll given to him by his numismatic friends there (more below from Tom Kays). 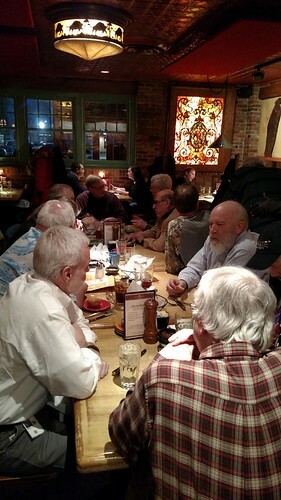 Others attending the dinner included Jon Radel, Chris Neuzil, Aaron Packard, Joe Esposito, Wayne Herndon, and Mike Packard. Here are a couple photos taken with my phone by Eric. Joe Esposito, Wayne Herndon, Mike Packard, Tom Kays. I brought two items for show-and-tell: my copy of Truth Seeker: The Life of Eric P. Newman, and an unawarded but nice Belgian Carnegie Hero Medal, a recent eBay acquisition. 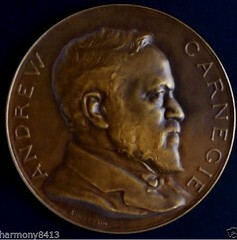 Here are the seller's photos, which don't do the medal justice - it's beautiful in person. 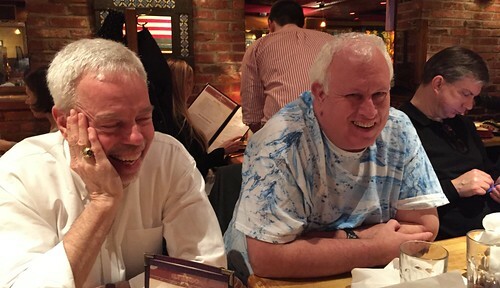 I had a great time at the dinner - good restaurant, great company, and fantastic discussions. 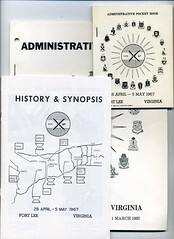 For the dinner, I brought a selection of documents and source material relating to the LOGEX military exercises that happened at Fort Lee, Virginia in the 1950s and 1960s. I had brought some early pieces of training scrip to an earlier dinner that was used to practice MPC change days. 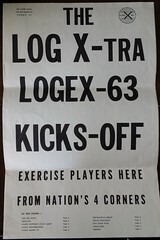 Recently, I managed to snag some additional materials, to include administrative handbooks, histories and synopses, a couple of newsletters ("The LOGEX Log"), supply prices lists, and a couple of pieces of the scrip, all dating to exercises held between 1963 and 1967. 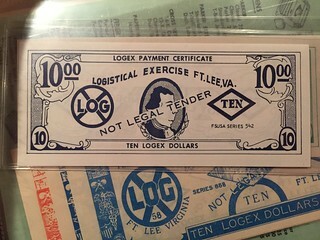 Having grown up a military brat, I am fascinated by military related currencies, and with the added interest of these being from Virginia, the LOGEX materials are well within my bailiwick. I haven't run across things like the handbooks before, so they add some historical context. I'm keeping an eye out for any other related materials. Nummis Nova met in Annandale at Silverado, a fine Tex-Mex establishment chosen by Steve Bishop. 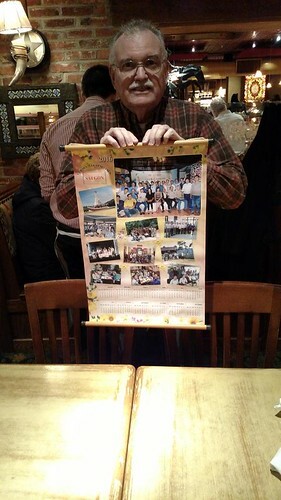 Present were Mike Packard, Wayne Herndon Joe Esposito, Dave Schenkman, Wayne Homren, Eric Schena, Howard Daniel, Aaron Packard, Steve Bishop, Chris Neuzel, Jon Radel, and Tom Kays ready for bib and tucker, I should say chips and salsa amigo. Here we are posing for the camera. No, wait. 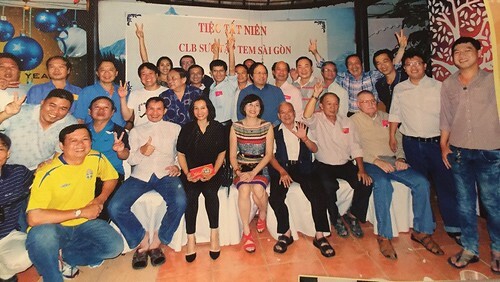 Howard Daniel showed us a 2016 calendar from the CLB SUU TÂP TEM - TIÊN of Ho Chi Minh City, Viet Nam which included a nice group photo of all the club members, Howard included. They do that every year apparently. I like this. Here is our table starting with the more mature end, headed by your E-Sylum editor in person. 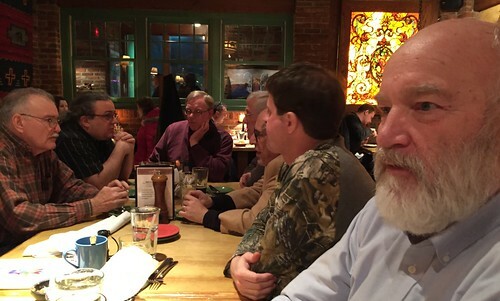 Pictured from left to right are Howard, Eric, Wayne Homren, Dave, Joe, Wayne Herndon, and Mike in deep contemplation of dinner. At my side of the table things were rather jolly, of course since I was there, and because we had already decided what we wanted off the menu and could relax in typical fashion. From left to right are Chris, Steve, and over the invisible divide on the more solemn side, on his phone, Aaron. Not pictured were Tom (your iPhone photographer for the evening) and the mysteriously out-of-frame Jon. Passing by during show-and-tell time were an Andrew Carnegie Hero Fund Medal, a Lao “Crocodile” Copper Ingot, one of three Eric P. Newman Patents (did you know he is an inventor)? 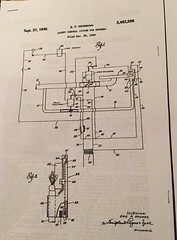 This one was filed December29, 1944 for a Safety Control System for Burners, and we used it as a book mark in the signed, limited edition biography, “Truth Seeker: The Life of Eric P. Newman which passed by, followed by an uncut sheet (remainders) of Demand Bank Notes for denominations of twelve and one half cents, 25 cents and 50 cents from the “Anti-Eatam Iron Works of Antietam, Maryland, dated 18__, a token estimated at only five struck from Norfolk, VA from R. Chamberlaine with Washington obverse, a pair of Russian coins: a 5 Kopeck piece dated 1793, but actually struck in 1797 over a 1796 10 Kopeck piece of the different cipher design, which, in turn, was struck over a 5 Kopecks of the usual design of Catherine the Great. 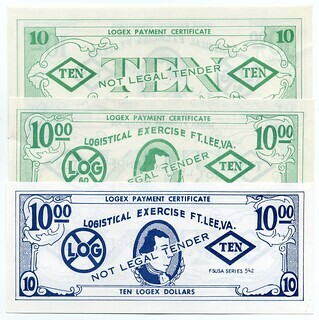 A binder with numerous U.S Army, Fort Lee, Virginia ephemera including Logistical Exercise (LOGEX) Payment Certificates circa 1967, toned, high Mint State (MS) silver dollars of 1879-S and 1890-S, Cardboard “Good Fors” from S.H. 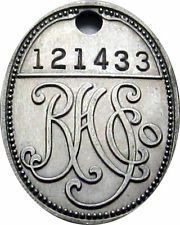 Robertson, Taylors Store Va, an 1823 New York Grand Canal Token from Tredwell Kissam makers of Hardware, Cutlery, and Looking Glasses, a General Tom Thumb Medal, World Map medal in white metal from the Crystal Palace, a four and one sixth cents token from 1884 good for one loaf of bread from F. M. Jack in Atlanta, and other most interesting tokens including from Sabins Music Hall, a Temperance Token from Albany House, and J. 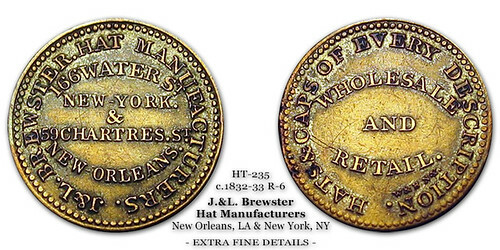 & L. Brewster, Manufacturer of Caps and Hats from New Orleans all of which landed on my dinner plate before entrees were served. In other words this was a pretty normal night for our supper club. At our end of the table we spent much time in amusing ourselves with the difficulties in locating War of 1812 Congressional Medals, from one that was used as a hockey puck to another that was said to be in the Smithsonian, but couldn't be located. We note that none of us had ever heard about thefts from the Smithsonian, as we have from other museums. It seems the Smithsonian holdings are so vast that items may turn up eventually from among the various buildings and divisions so that nothing is missing even if its present whereabouts are not known. 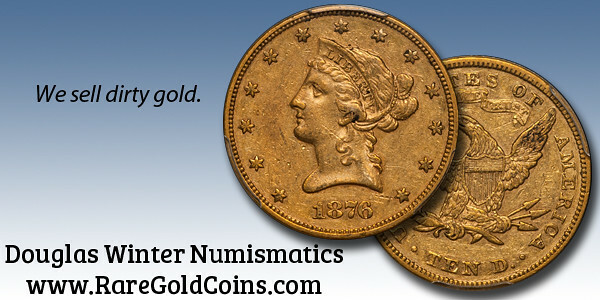 1849: THE PHILADELPHIA MINT STRIKES GOLD. Award-winning researcher Michael Moran and gold-coin specialist Jeff Garrett chronicle the tribulations of the U.S. Mint in the first half of the 1800s and the tremendous impact of the 1848 discovery of gold in California. 352 pages, hardcover, full color, 8.5 x 11 inches. Order your copy for $49.95 at www.WhitmanBooks.com , or call 1-800-546-2995. Howard Koslow, a painter and illustrator who for more than four decades designed many of the most recognizable stamps issued by the United States Postal Service, including a 1994 series depicting famous blues and jazz musicians and 30 stamps depicting coastal lighthouses, died on Jan. 25 at his home in Toms River, N.J. He was 91. 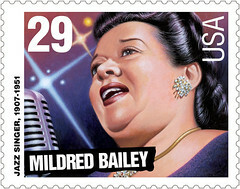 The following year, for a series honoring the national parks, Mr. Koslow designed a six-cent stamp that depicted an evening concert at Wolf Trap National Park for the Performing Arts in Vienna, Va.
Each subsequent series celebrated a different region: the Great Lakes, the Southeast, the Pacific and the Gulf. The final series, devoted to the lighthouses of New England, was issued in 2013. Howard Bertram Koslow was born on Sept. 21, 1924, in Brooklyn, where he grew up in the Flatbush neighborhood. His father, Benjamin, was an electrician, and his mother, the former Ruth Sachs, was a housewife. Even in the normally placid world of stamps, Mr. Koslow sometimes encountered controversy. In designing a 33-cent stamp in 1999 honoring the artist Jackson Pollock, Mr. Koslow worked from a well-known Life magazine photograph, by Martha Holmes, that showed the artist at work in his studio, a cigarette dangling from his lips. Mr. Koslow removed the cigarette in accordance with Postal Service policy, which forbade any image that could be seen as promoting tobacco use. Last week’s World Money Fair was considered an overall success in its 45th consecutive year, with a steady stream of collectors and dealers alike passing through the turnstiles. The annual three-day event concluded on a positive note Sunday with end-of-the-day and last-minute deals for some lucky collectors. Held at the Estrel Conference Center on the east side of Berlin, this year’s guest of honor was the Mint of Korea, or KOMSCO. 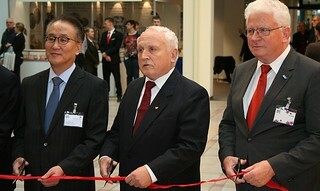 As part of the welcoming committee, the Republic of Korea’s ambassador, His Excellency Kyung Soo Lee, joined KOMSCO president Kim Hwa Dong, the World Money Fair’s lifetime honorary president, Dr. Albert Beck, and its current president, Hans-Henning Gohrum, to formally open Europe’s largest numismatic fair. Much of the European continent is experiencing a mild winter and Berlin is no exception; the weather did not deter or hinder attendants making their way to the popular venue. Together with pleasant temperatures and just a bit of rain, enthusiasts lined up more than an hour in advance to wait for the doors to open. This year saw over 50 official mints, central banks, or private mints on hand to display their products, along with over 200 private dealers and coin suppliers from all over the world. The main auditorium highlight for 2016 was the pavilion for KOMSCO, which dominated the landscape. As South Korea will be hosting the 2018 Winter Olympics, images of coins celebrating the event were prominently displayed. The UK’s Royal Mint took the opportunity to give interested collectors a first glimpse of the 2017 twelve-sided pound coin which will be entering circulation early next year. Of particular interest this year was the inclusion of the Central Bank of the Democratic People’s Republic of Korea, or North Korea, which both sold and exhibited coins and bank notes for the very first time. It was reported that delegates from both KOMSCO and the North Korean Central Bank enjoyed their encounters with one another, enabling them to exchange ideas and findings without the hindrance of government ministers. Thailand’s Royal Mint utilized the occasion to unveil its new wildlife series of gold and silver coins featuring the white elephant, a national symbol that is reportedly a favorite animal of Thailand’s King Rama IX. The coins feature an updated portrait of the King on the obverse, with a charming and detailed reverse image of a mother elephant and calf. he Royal Canadian Mint, a popular participant of the World Money Fair, introduced a new DNA feature to their bullion coins, enabling authentication of the pieces with the addition of readable laser technology. The Federal Mints of Germany also introduced a new commemorative coin product with two significant updates: the face value of their 18 gram silver commemorative coins will go up, while seeing a welcome increase in silver content for the issues from 62.5% to 92.5%. The first coin released with this new specification is dedicated to the children’s tale, “Little Riding Hood,” by the Brothers Grimm. Dealers and exhibitors reported a noticeable decrease in sales due to the conspicuous absence of Russian and Chinese dealers and collectors, mostly due to downturns in their economies and the devaluation of both currencies against the euro and the dollar. Bullion pieces continued to show vigorous sales levels and, as was noticed last year, high-priced graded and encapsulated or “slabbed” pieces were also in demand from the investor side of the business. Central banks should stop issuing £50, $100 and €500 notes to tackle crime, according to a former bank boss. The high-denomination notes are favoured by terrorists, drug lords and tax evaders, argues Peter Sands, former chief executive of Standard Chartered bank, in a new report. Illegal money flows exceed $2 trillion (£1.4 trillion) a year, Mr Sands said. Rather than focus on the criminals, his report argued G20 countries should now target the cash itself. Mr Sands, who produced the report for the Harvard Kennedy School, urged the world's 20 largest economies to take up the matter before their next summit in China in September. High-value notes issued by rich countries are the "currency of corrupt elites, of crime of all sorts and of tax evasion", Mr Sands said. "They play little role in the functioning of the legitimate economy, yet a crucial role in the underground economy," he added. "The irony is that they are provided to criminals by the state." Banning the notes would not stop crime, but it would make hiding transactions more costly and more difficult, Mr Sands said. 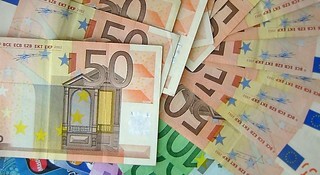 His report comes after the European Commission said last week it would investigate the use of €500 notes. 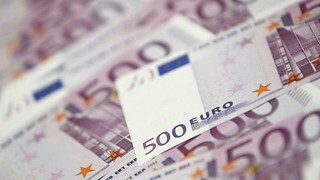 The European Central Bank welcomed the investigation, but senior officials also said they needed more evidence that the notes facilitate criminal activity. 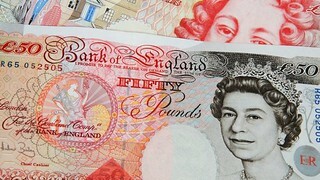 The UK asked banks to stop handling €500 notes in 2010 after a report found they were predominantly used by criminals. The suspects in the case work at the Royal Joh. Enschedé in Haarlem, Noord-Holland, multiple media outlets reported. Detectives descended on the site earlier on Wednesday. Authorities were not confirming details as the investigation is ongoing. The theft includes printed bills with and without serial numbers, a source told Crimesite. No estimate of stolen cash was provided. The website for the 412-year-old company says it began printing banknotes in 1814. It has since evolved into “the specialist for special, secure, and highly trustworthy print work and related services,” the company stated. It is not yet known how the theft was discovered. He has been variously called “Basil” or “the ghost,” a mystery man with red hair and a lanky frame who appears to have played a crucial role in the largest burglary in England’s history — before disappearing. Over Easter weekend last year, when four aging thieves stole $20 million in gold, jewelry and gems at the Hatton Garden Safe Deposit bank in central London, a video camera recorded the man, about six feet tall and wearing a cap. The police suspect that he opened a fire-escape door that allowed the rest of the gang to enter the building, and that he knew the door codes and sought to disable the alarm protecting the safe deposit boxes. Now, the mystery of Basil’s identity has taken a twist after one of the four ringleaders of the theft, Daniel Jones, 60, wrote a letter to Sky News saying that Basil was a former police officer who was involved in private security. The burglary at Hatton Garden, led by the four white-haired thieves who were hoping to fatten their pensions, has captivated Britons and drawn headlines around the world. In April, Mr. Jones; John “Kenny” Collins, 75; Terry Perkins, 67; and the gang’s elder statesman, Brian Reader, 76, committed what they hoped would be one last career-topping heist. 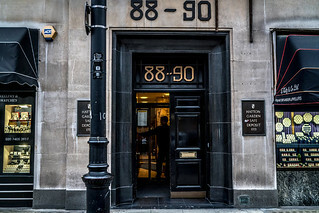 After sliding down an elevator shaft at 88-90 Hatton Garden in London’s diamond district, they used power drills to bore a hole through a reinforced concrete wall. Then they ransacked 73 of more than 900 safe deposit boxes, taking jewelry, gold, cash and precious stones. The heist has attracted particular notice because of the ages of the men, who proved to be ill equipped for the digital age. Mr. Reader took the bus to the burglary. The operation was meticulously plotted with the help of the book “Forensics for Dummies.” But their apparent ignorance of modern-day police techniques contributed to their undoing. The men continued to use their cellphones, even after the theft, helping the police trace them. It's not often you can find numismatics-related programming on TV, but the History Channel has starting a series about the search for the R.M.S. Republic, which sank in 1909 with a fortune in gold coins. It’s late summer. A warm sea breeze is blowing in Gloucester, Massachusetts. The town is filled with holidaymakers, locals and pleasure boaters. Many have been out on the water all day, trying to catch a fish, or just breathing in the air of the North Atlantic. More than 100 years ago, however, there was a near tragedy not too far away. In 1860, 100 miles (161km) off this shore, one of the world’s biggest steamer ships slowly began to fill with water. 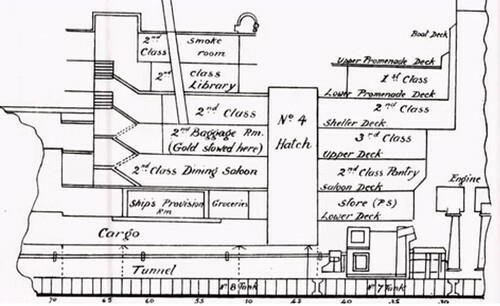 By sheer luck, the SS Connaught’s passengers were saved, but its haul – millions of dollars’ worth of gold coins – sank to the bottom of the ocean. It’s because of this that a tall, neatly dressed Floridian has come to Gloucester to inspect his boat. Micah Eldred has pinned his hopes on finding the treasure of the Connaught. He is one of only a handful of people who knows exactly where the huge wreck lies – and he believes he’s figured out how to retrieve its bounty. The deck of Eldred’s boat is crammed with equipment – winches, cables, even an underwater robot. Almost everything is in place for an expedition to bring that glittering gold out of the darkness. If Eldred and his team succeed, they will become some of treasure-hunting’s great pioneers. This is a story about a new wave of salvagers, armed with high-tech sonar, navigational systems and robots, who are targeting lost troves of treasure lying on the ocean floor. As the cost of instruments has fallen in recent years, more and more adventurers have emerged, from billionaires to hobbyists. But this is also a story about a very particular shipwreck. It concerns one of the most miraculous maritime rescues of all time, a hefty cargo of gold coins – and the hardy team now trying to take them back from the sea. Eldred laughs about it. “Told us to come back when we have the gold,” he writes in an email remembering the incident. 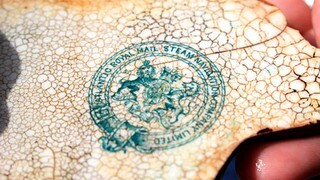 But the significance of that piece of broken china, with “Atlantic Royal Mail Steam Navigation Company Limited” in ocean green lettering is not to be missed. It proved beyond doubt that the ship really was the SS Connaught. Minor denomination rarities and patterns from post-1871 Germany constitute one of the highlights of the upcoming Künker Auction. 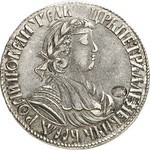 Furthermore, there will be ancient coins, a large selection of medieval coins, coins from Germany, Europe, Russia and overseas. This spring Künker will be presenting four catalogs. From antiquity to the Federal Republic of Germany, there will be coins and medals from Germany (including a special collection Münster), from Europe (with large sections of Carolingian coins, as well as Danish and British medieval coins), from Russia and overseas. For many the highlight will take place on the last day of auction: when Künker auctions off the Lothar J. Lorenz Collection, a special collection of minor denominations rarities and patters from post-1871 Germany. Not to forget silver and gold, this auction catalog offers all the great rarities of the German Empire in spectacular quality. 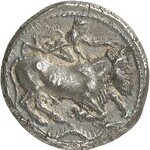 The auction will kick off with 60 Celtic and 440 Greek coins. 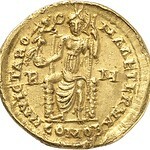 And the connoisseur will certainly note many rarities: For example, a selection of Bavarian rainbow cups or the two tetradrachms from Katane: the first is an archaic piece displaying the river god in disguise as a bull (127, EF, Estimate: 50,000 euros) and the second is a classic piece presenting the portrait of Apollo made by Herakleides, perhaps the most beautiful coin of all time (129, EF-VF, Estimate: 50,000 euros). 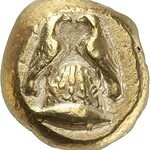 There are many interesting coins among the ancient Greek coins: For example, a dekadrachm from Syracuse, a golden distater of Alexander, or an electron stater from Cyzicus displaying both eagles meeting above the omphalos, after they flew around the globe. 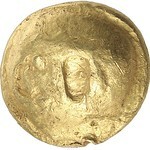 The Egyptian department offers a rich selection of gold coins. 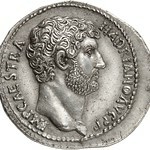 Collectors of Roman coins should take a good look at the catalog. 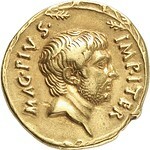 There are many Roman Republican pieces. 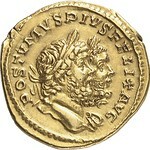 Historically highly important is an aureus of great rarity issued by Sextus Pompey showing his portrait on the obverse and the portrait of his father and brother on the reverse (566, VF, estimate: 75,000 euros). The department of the Roman Empire also offers plenty of aurei. 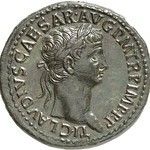 Caligula with Augustus, Titus, Domitian with Domitia, Marcus Aurelius, the youthful Caracalla with Septimius Severus and Iulia Domna, Herennia Etruscilla as well as Priscus Attalus – and these are only a few examples. 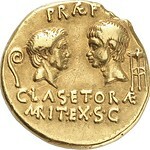 The rarest piece is an aureus of Postumus, which displays his and Hercules’ double portrait. 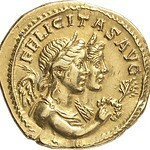 On the reverse it shows the busts of Victoria and Felicitas (901, plugged hole, EF, estimate: 75,000 euros). 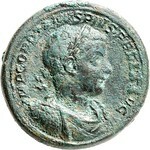 There are, of course, also extremely well preserved silver and bronze specimen with exquisite patinas. 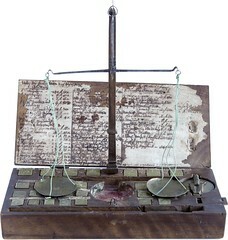 Such as the title piece of the auction. 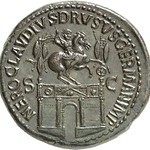 A cistophorus of Hadrian with the temple of Roma and Augustus on the reverse (742, EF, estimate: 5,000 euros). 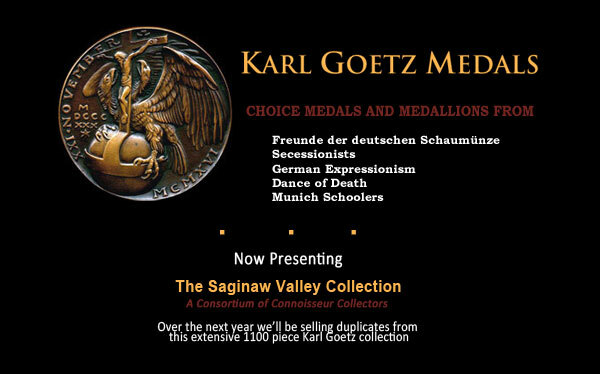 Even longstanding collectors will be in awe considering the extensive selection of medallions for sale. 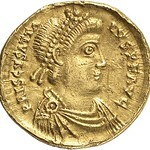 Let us tell you about two specimens: an extremely rare bi-metallic bronze medallion displaying the arrival of the “wheat fleet” in the harbor of Ostia (811, VF, estimate: 5,000 euros) and a 324 gold medallion in the weight of one and a half solidi of Constantine the Great minted in Nicomedia (938, VF, estimate: 10,000 euros). Last but not least, there will be strikings of the great migration, of the Byzantine Empire, of the Crusaders and the Near and Far East. 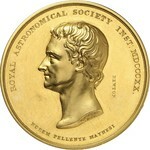 The fact that coins with great historical meaning don’t have to be expensive can be proven by a 5759 free mason medal. 5759? Yes, you did read that right, because the free masons started their calendar with the year of light in 4000 B.C., thus postulating when the world was created. The year 5759 equals 1759 of our calendar. 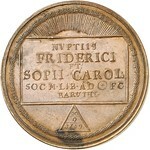 The medal, which motifs allude to the secrets of the free masons, can be found in Künker catalog 274 under number 1644. 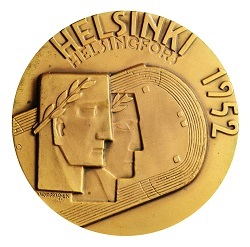 Extremely fine in its preservation, the medal is estimated at 150 euros. 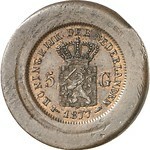 Among the pre-1871 German coins you will also find more expensive pieces. Just look at the great selection of lösers from the duchies of Brunswick. The most pricy piece is estimated at 7,500 euros. 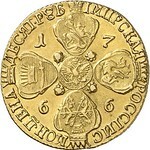 It’s a 1647 triple reichstaler from Friedrich of Bruswick-Lüneburg-Celle from Clausthal. The reverse displays two embracing miners in front of a shaft, which represents the widespread desire for freedom at the time. An historic and distinguished document for the baroque court ceremonies can be found in two talers of Louis VIII of Hesse-Darmstadt. They show scenes of royal hunting parties with impressive animal imagery. At his time, Louis was an avid devotee of the hunting sport, and for rewarding his hunters he had these so-called stag and hunting talers produced. 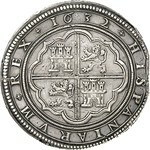 The first catalog is finally concluded by a Münster special collection, including many rarities, a large selection of rare Saxon coins, and, finally, an extensive collection of German and world coin scales. World coins are following this section. 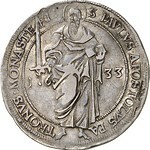 Collectors of medieval coins will study these pages of the catalog with intensity. 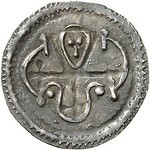 There are almost 50 Carolingian coins, about 70 strikings from the Danish Viking-period, and last but not least, almost 150 early pennies from Great Britain and Ireland. Of course, as always, the modern department offers the accustomed quality. 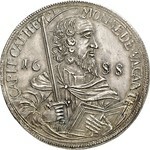 For example, we can present to you a 1632 cincuentin, minted in Segovia, in a spectacular condition. 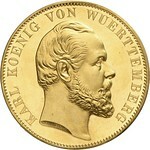 On Wednesday afternoon Auction 275 will start with world gold coins and medals. In particular, the French-Belgian region will be a focus. The selection on offer ranges from a gorgeous heaume d’or of Louis of Male to a Merovingian coin of the Abby of Saint-Maurice located in the Valais and an octuple Louis d’or from 1640. But there are also many other interesting varieties of the ‘normal’ Louis d’ors. Let’s take, for example, the year 1786: From this particular year Künker offers single and double Louis d’ors from Paris, Bordeaux, Limoges, Nantes, and Lille. Aficionados of British gold coins should also study the catalog thoroughly. 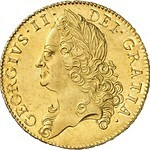 They will find many rare 5 guineas-pieces, but also a series of 1/2 and 1/3 guineas and sovereigns in extraordinary preservation. The title piece, which is also the piece going over the auction block with the highest estimate of 150,000 euros, derives from Gdansk. 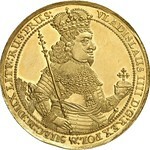 It’s an 1644 8 ducat displaying the title and the portrait of Vladislaus IV and on its reverse a magnificent view of the city of Gdansk. 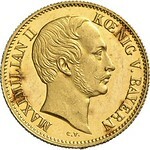 Estimates in the area of pre-1871 German coins don’t quite reach as high, but you can find many outstanding rarities, mainly stemming from the Vogel Collection. 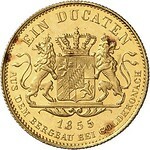 Among them, for example, an 1855 Bavarian ducat, a later striking from the yield of Goldkronach, estimated at 50,000 euros, a gold off-metal strike of 10 ducats made from the dies of the Bremen taler of 1864 on the opening of the new bourse estimated at 20,000 euros, and another gold off-metal strike of 20 ducats made from the dies of an 1871 double vereinstaler from Württemberg, estimated at 30,000 euros. 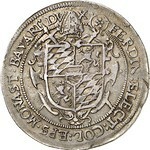 From an extensive collection of coins from Münster (also refer to Auction 274), comes a sextuple ducat of Christoph Bernhard of Galen on the 1661 capture of Münster, estimated at 20,000 euros. 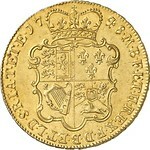 And finally, there is a truly spectacular unique rarity: a late gold off-metal strike of the so-called butterfly taler in the weight of 11 ducats, estimated at 25,000 euros. 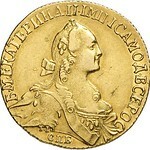 The section will be followed by almost 400 Russian coins, containing many rarities. 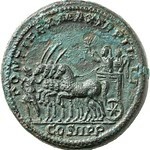 For example a 1718 2 ruble piece of the Red Mint of Moscow (4931, VF-EF, estimate: 10,000 euros), a poltina displaying the date 1720 in Cyrillic struck in the Kadashevsky mint in Moscow (4935, EF+, estimate: 25,000 euros) and a 1766 10 rubel piece in gold from St. Petersburg (4999, almost EF, estimate: 10,000 euros). Minor denominations are also plentiful and hold unexpected treasures. 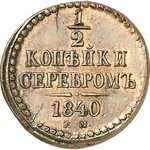 The connoisseur will find an 1840 copper novodel of half a kopek emitted in Yekaterinburg. This very rare piece not only comes in an extremely fine to brilliant uncirculated condition and a beautiful patina, but also with the expertise of Igor Schiryakov of the State Museum Moscow (Estimate: 1,500 euros). You can order the catalogs at Künker, Nobbenburgerstr. 4a, 49076 Osnabrück; Tel: + 49 541 96202 0; Fax: + 49 541 96202 22; or email: service@kuenker.de. Please also find all pieces up for auction online at www.kuenker.de.